This Rumah Penghulu used to be a local headman's house. It was originally located in Kampung Sungai Kechil, a small village in Mukim Bagan Samak, Bandar Baharu, Kedah. From the mid 1920s to the early 1930s, Penghulu Abu Seman bin Nayan completed the ensemble of buildings which make up the house. When he died, his son Ibrahim bin Abu Seman inherited both the title and the ownership of the house. Unfortunately Penghulu Ibrahim had no son to succeed him and the house was eventually left vacant. The three main sections of the house, the balai hall, rumah ibu main house and dapur/ruang makan kitchen/ dining room were constructed at different times and their origins differ. The rumah ibu was originally built for a Tok Taib who was a person of note in Kampung Paya Takong. When the latter passed away, this structure was sold to Penghulu Abu Seman who dismantled and moved it to kampung Sungai Kechil in 1924. The balai was probably added in the 1930s. Most Malay houses do not include a balai. This structure was in fact built by the government as an office for Penghulu Abu Seman. It includes the covered verandah described as the pejabat office and the bilik penghulu penghulu's room. Community and other administrative matters were resolved in the balai which also served as a meeting room. According to residents of the area, the bilik penghulu was sometimes used as a temporary "lock-up" for offenders when the penghulu so decreed. Detailed carvings reflect the skill of the Malay craftsman and the status accorded to the position of the penghulu. Unlike the rest of the house and to make a distinction between the home and the office, only footings support this structure. There are no tiangs pillars. The stairway to the balai is the formal entry to the house and an internal stairway leads from the balai up to the rumah ibu. 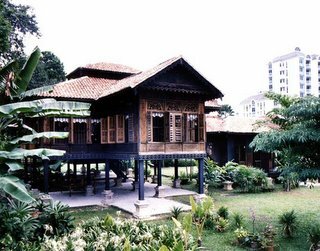 The rumah ibu, as is typical of other Malay houses, is elevated highest from the ground. Used for public functions and entertaining guests, it also includes the bedrooms. Entrances to both bedrooms are denoted by fretwork archways. Framed above each archway is a coloured carving which depicts two birds. The archways were originally painted silver with a green trim, probably for a festive occasion. These colours have been replicated as part of the restoration. Origins of the dapur/ruang makan are unclear. It could have been built in Bandar Baharu or relocated from elsewhere. As in other Malay houses, the floor in this domestic area is lower than that of the rumah ibu and separate stairways are provided. Carvings and windows are less ornate here. 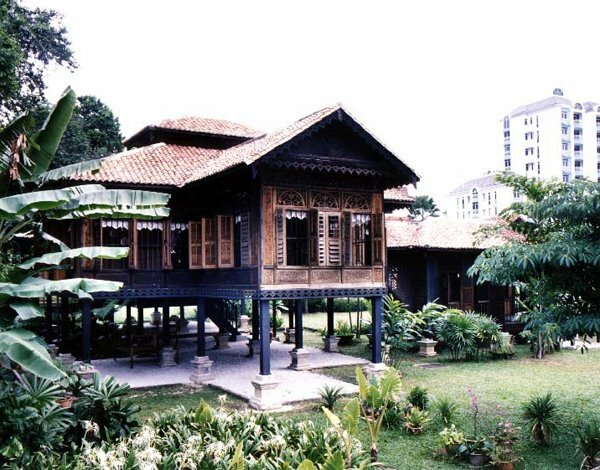 Recognizing that they did not have the resources to completely restore the house, Penghulu Ibrahim's family sold it in 1995 via an intermediary to Badan Warisan Malaysia. We requested Tuan Syed Ahmad Iskandar Syed Ariffin of Universiti Teknologi Malaysia to prepare measured drawings, Mr. Hong Lay Thong of the Forest Research Institute Malaysia (FRIM) to compile a dilapidation study, and En Yahaya Ahmad of Universiti Malaya to produce a Scope of Work and to manage the project. FRIM was selected as the contractor for the dismantling and reconstruction of the house under the supervision of Tuan Haji Mohd Shukari Midon. Prof. Ezrin Arbi of the Universiti Malaya was an advisor throughout this process. On May 13, 1996, YBhg Tan Sri Dato' Seri Ahmad Sarji bin Abdul Hamid, President of the Badan Warisan Malaysia officiated the formal commencement of the dismantling of the house. By the end of the month, the dismantled house was moved to its present location at No 2 Jalan Stonor, Kuala Lumpur. The smooth transition from Bandar Baharu to Kuala Lumpur was made possible by the support of YBhg Dato' Haji Mohd. Shariff bin Abu Samah, who was then the District Officer of Bandar Baharu. Site preparation, laying out of the footings, cleaning and preparation of original and new timber occupied the next two months. Levelling of the site was a challenge for the site work contractor, Jaya Renovation because of the gradient of the land. Minconsult Sdn Bhd designed concrete pads and compacting requirements for the terrain. In keeping with the original house where hardwood was used for structural components and softer wood for nonstructural elements, cengal (and in its abscence balau) was purchased for the former and dark red meranti for the latter. On August 8, 1996, the raising of the tiang seri main column marked the official commencement of the reconstruction of the house. In keeping with tradition, YBhg Tan Sri Dato' Seri Ahmad Sarji bin Abdul Hamid placed the original 1916 Straits Settlement coin which was found under the tiang seri back in its position along with a 1996 one ringgit coin to commemorate the restoration. The challenge in the timber work was to ensure that elements removed from the original house were replaced in the restored house, and to refashion any new elements in exactly the same form as those that were damaged. Five panels, which comprise the entire frontage of the rumah ibu, were reassembled and installed. Windows with shutters had to be rebuilt. When all the timber work was completed, the entire house was oiled and termite treated. In March 1997 Intelu was awarded the contract to lay the roof tiles. These clay tiles are of Chinese origin and are typically used on shophouses. En Paiman Keromo of Muzium Negara provided sound advice on the proposed work. The house required about 31,000 tiles but only 15,000 had been salvaged from the original site. However, through the generosity of YABhg Datin Seri Nila Inangda Manyam Keumala and En Paiman and the help of En Asmadi Sairi of Intelu, we were able to source the remaining tiles. Landscaping and electrical wiring followed the timber and tile work. Puan Kamariyah Kamsah of Institut Teknologi MARA was the landscape designer and the electrical work was undertaken by Yap Electric. YBhg Puan Sri Frances Ariffin has taken on the challenge of planning and sourcing the exhibits for the house. A great tourism guide of Malaysia to see the country in brief, if you are first time traveler you should get to know the travel destination for safe staying and spending candid moment with your dear and nears. Come fly with xiamenair.com/en-my/, flight with amazing insight service to and from many Asian and European continent.